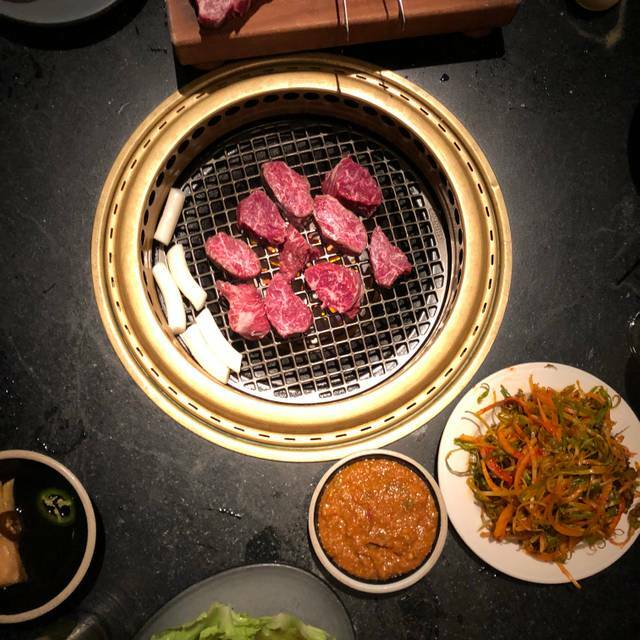 New York City's first Korean Steakhouse. 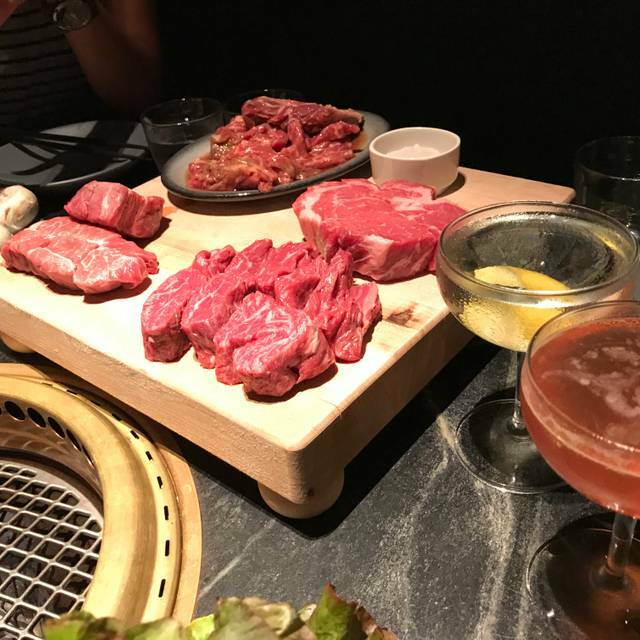 At Cote we combine the the conviviality of the Korean BBQ experience, along with Prime Cuts of Beef, Classic Cocktails, World Class Wines, and Gracious Hospitality. Japanese Wagyu x American Black Angus. "The best of both worlds"
the food was divine and the service was impeccable. loved the sommelier there as well. we had the steak omakase and it was worth every cent. if I had one note for this place to consider, it would be the bathrooms -- they should be cleaned often or have an attendant there, as it's loaded with foot traffic and should be kept up! This was the best meal I have had in a while!! and the service was AMAZING! Went right when they open at 4pm. Did the butchers feast for 6 and was a fantastic deal. Amazingly friendly and competent service making for a nuanced Korean bbq experience. It was my favorite meal of 2019. Great service, ambiance and delicious food. The butchers feast is so filling. You don't need to order more. Can't wait to get back again! Server totally over sold us on food. We would have been fine with the inclusive meal option, but got another side based on her strong, persistent recommendation. All four of us agreed it was absolutely unnecessary. Don’t know where the one Michelin star came from but it does not deserve it. There is no chef other than to make the salads. The waitress cooks for you and she burned our veggies. The meat was mediocre, not great. 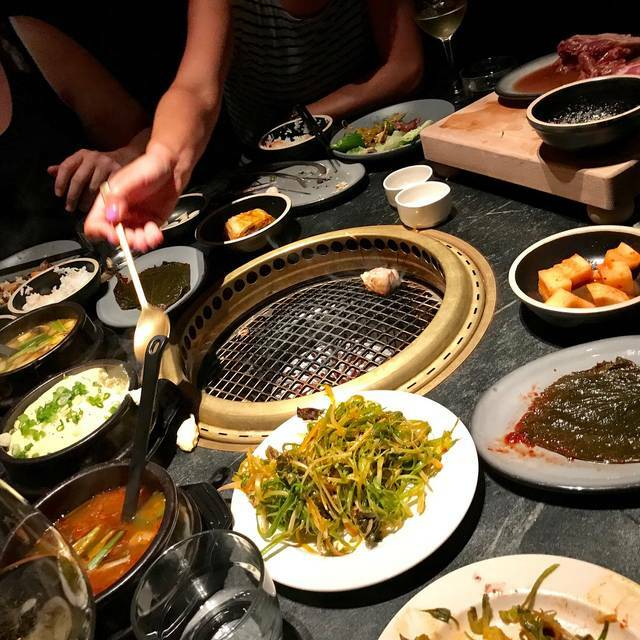 For the money, actually less, there are much better Korean BBQ places in NYC. Also, the table behind us was extremely intoxicated and rowdy and the establishment did nothing to ask them to quiet down, they just kept bringing them the Jack Daniels based drinks that they all ordered. One Michelin star restaurants are usually classier than this place. Go if you like but set the bar low for your experience. First a steak house, then a Korean restaurant. 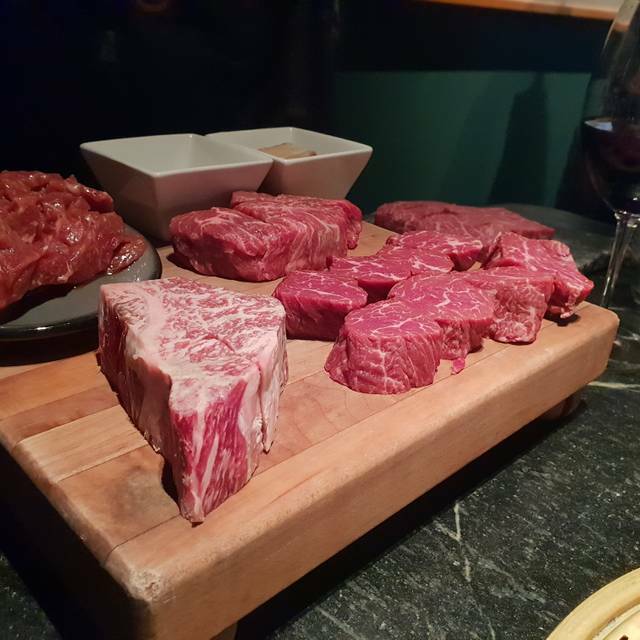 The meat selection of Cote is by far the best out of any Korean barbecue restaurant- in fact, much better than most steak houses. The staff is knowledgeable and willing to suggest once they know your thoughts. Pricing is honest, yes the steaks are expensive but the side dishes are inclusive and so is water. Highly recommend. bland food. cote is to korean food as benihana is to japanese. something that would make a person not interested in anything but unseasoned meat and a carb feel that they had an authentic foreign food experience. Second visit. First timers probably get the Butchers Feast, but I recommend ordering a la carte. 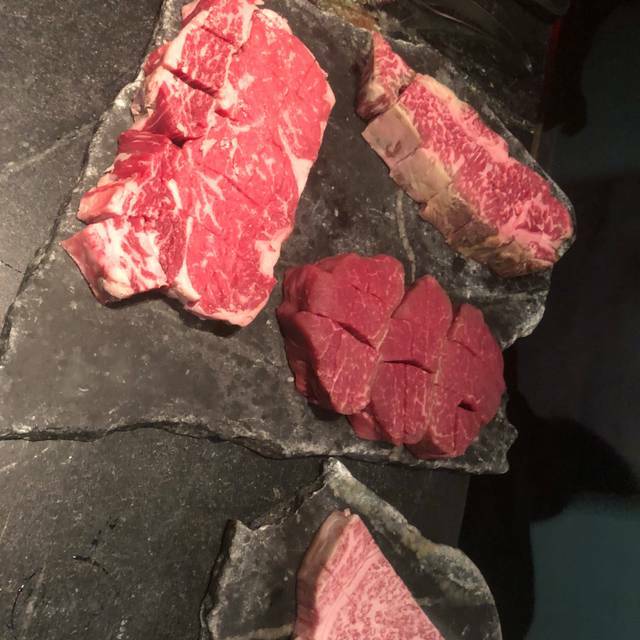 It is a little more expensive but you get the exact cuts you want and instead of unnecessary sides, you can splurge and get some A5 Wagyu. It was amazing from beginning to end! Holiday friends dinner on Saturday, 12/8. Service and meats were excellent. I just wish that other food groups were explained a little better as our table was not familiar with Korean dishes and did not know what we were trying. I have been before to Cote and had a great meal but spent a fortune...this time we got the tasting menu for $58./person...the meat was very good but the sides were just ok that came with it...plus, I think the atmosphere is cold and extremely noisy and the entrance feels like you are going into a disco...sorry to say but I do not think I will return.. for the money spent with drinks etc., it still costs $100./person. Could only get an 11:15 reservation days in advance and even then they made us wait 30 more minutes. Wouldn’t accommodate a seafood allergy and were overall rude. Food wasn’t the best, especially for the price but the aesthetic was nice. Delicious food. Had a great meal with many delicious and varied kinds of steak. Cocktails also excellent. Incredibly beautiful take on Korean barbecue. The meats were no doubt incredible quality. However, the side dishes were nothing extremely unique or to write home about with the exception of the egg souffle. Service was great but somewhat impersonal... the server didn't really even introduce each cut of meat.. which I'm assuming is the whole point of doing an omakase. Either way it was still a fantastic experience. 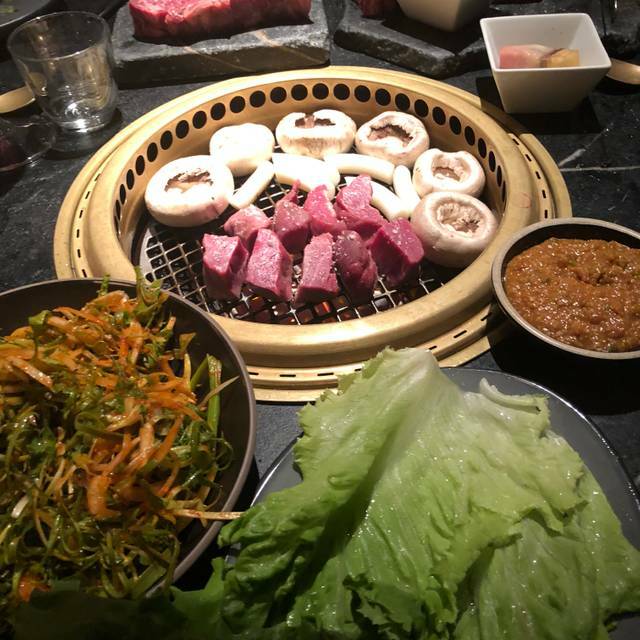 While KBBQ purists might not love this place, if you go in knowing what to expect--American steakhouse meets Korean BBQ--you won't be disappointed whatsoever. This was a meat lover's paradise. Amazing and the bar downstairs is a great surprise. The staff made us feel welcomed the moment we walked in. We let the staff cook for us and everything came out perfect! We felt bit rushed when the wine was served before our dinner and we barely had time to enjoy our cocktail. Overall, it was a great dining experience and we plan to come back in a month with family visiting from out of town. Ridiculously loud. Overpriced. I can’t believe they have a Michelin Star. Have been to mostly all of the best and above average spots in Manhattan and this ranks as one of the most underwhelming experiences. Very disappointing from ambiance, service, menu. Experience was like a converted pool hall turned overpriced Asian steakhouse. AVOID. The place has a great menu but the service and the ambiance is not what we expected it. I would only recommend it if you have no other place to go. 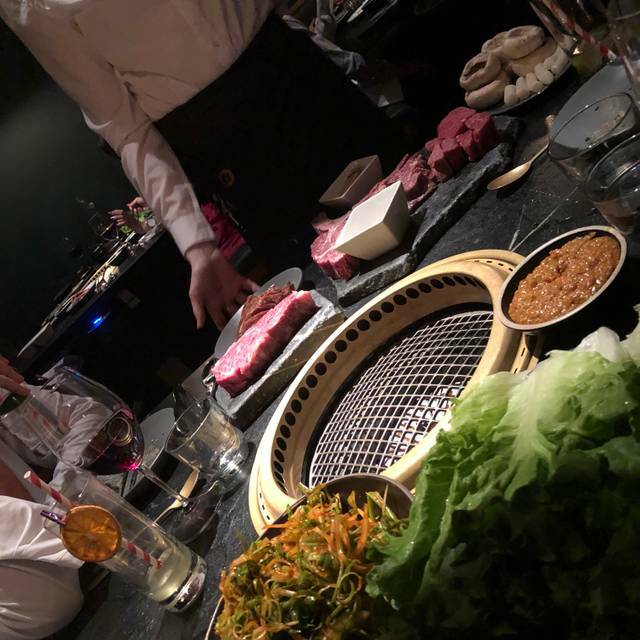 It was our family dinner and everyone enjoyed the experience of great Korean BBQ! We're party of three. We went three women two adults, one child . We ordered two sets of steak and one cote steak , one beef tartare and a glass of wine. But it came out wrong, so it served 4. We left a lot of food and had to pay a lot of money. And it wasn't impressive enough to get a Michelin One Star. In Korea, restaurants of that level are common. For a Michelin starred restaurant in NYC, we waited quite a while for a server to come around to take our order. Aside from that, great food and great cocktails. This last visit was our second and we'll definitely consider going back again. Amazing food and drinks! Would highly recommend this place! Awsome staff, they are very friendly and nice. High Quality of meat. 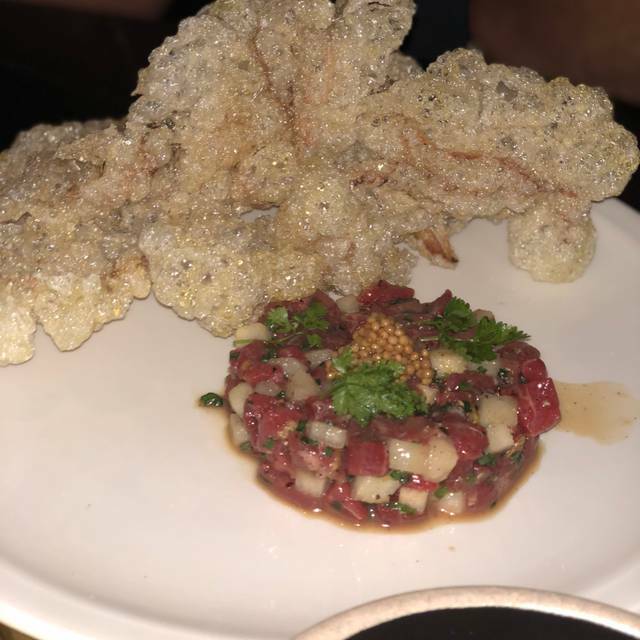 Our early evening reservation was perfect for our group of 5 (2 adults and 3 children) where we enjoyed the Butcher's Feast, a sampler of sorts that I highly recommend for your first visit. The very interactive dining experience was well enjoyed by our children and promoted active conversation and yielded little opportunity for interacting with electronic devices. The side dishes were flavorful and complimented the copious portions of red meat. 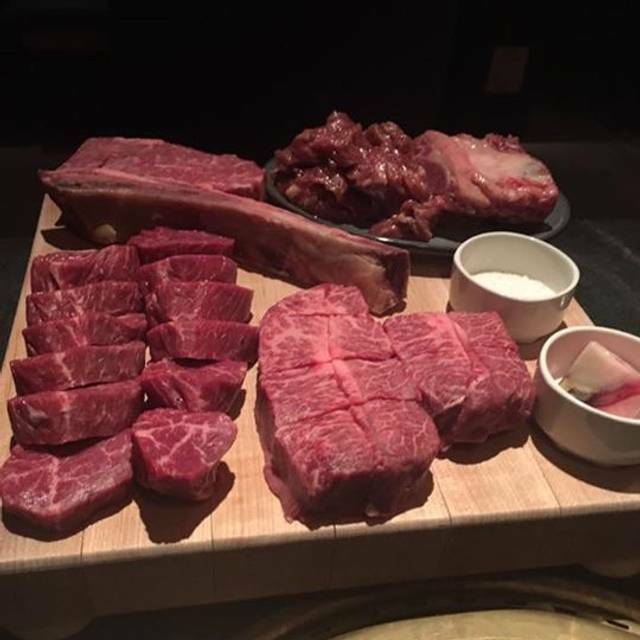 The service was spot-on and we found the Cote mantra of "Meat + Fire + Booze = Smiles!" to be very accurate for the adults - and we created our own child friendly mantra of Meat + Fire + Soft Serve= Smiles! for the children. We will definitely return for another early evening with the children and also a later evening with a group of carnivorous friends to indulge in more red meat and the tasty and creative libations. The ambiance of the restaurant, service and quality of the food and meat were simple perfect! Totally recommend it! Can't wait to be back again.